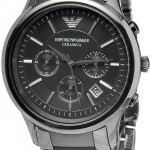 Emporio Armani Men’s Watch AR2457 Review. Hello, today I’m doing a Emporio Armani AR2457 review. Armani are a leading brand for designer watches, they have a huge selection of stylish watches available that are in an affordable price range. Today I’m taking a look at one of their most popular models, the AR2457. 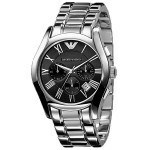 Anyway, I’ll get on with my Emporio Armani AR2457 review below and you can find out the price on Amazon today, enjoy. Armani really excels with their timepieces, they have quite the following for people who are after designer watches that suit their style, and with such a large selection of watches Armani often have something suitable for everyone. If you get a chance I suggest reading our 10 best Armani watches for men. This model from Emporio Armani has a very professional look with a slightly minimalist feel to it. The dial has a high visibility design to it with the black dial and silver baton style hour markers and hands. In my opinion, this made the watch very easy to read. You’ll also notice the little date display at the 6 o’clock position which is in keeping with this nice symmetry of the watch. 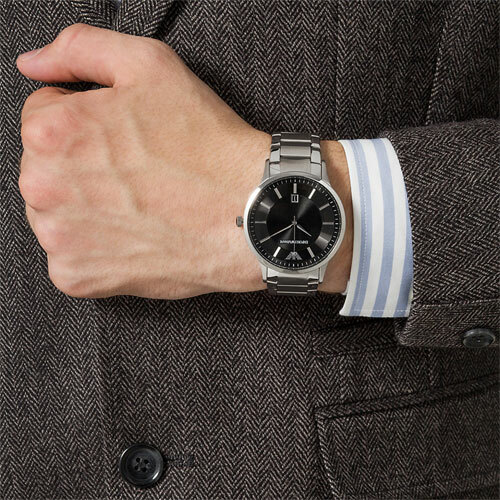 As is fairly common in Armani watches, the AR2457 uses a Japanese quartz movement. This types of movements are popular as they’re reliable, accurate and fairly low in price which means manufacturers can keep the cost of the watch down. As I’d expect to see in this price range, this watch uses a mineral crystal glass. Mineral glass is specially hardened to offer better resistance against scratches and knocks. 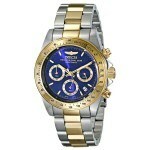 Whilst sapphire glass would have been better, it often costs a lot more so is typical of more expensive watches. A benefit of mineral glass over sapphire is that it actually offers much better shatter resistance. The Armani AR2457 has some fairly standard size specifications. 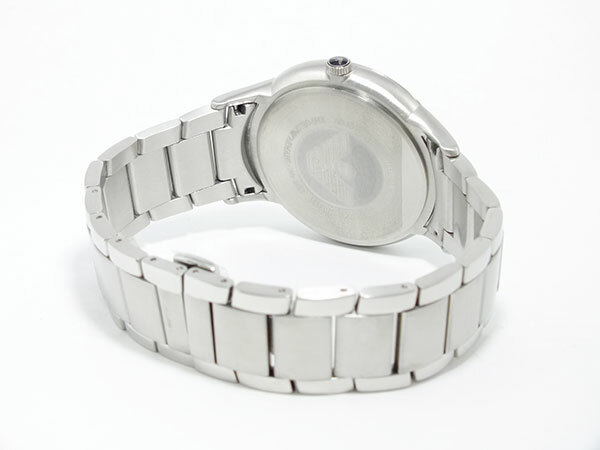 The casing diameter is 43mm which is a popular men’s large size. The casing thickness if 11mm which is pretty standard and sits on the wrist nicely. I mentioned the date display earlier on, it’s a simple date function that will need to be adjusted for the varying amount of days in each month, as is common with many watches. The black background blends in with the rest of the dial, leaving the silver numbers to stand out on their own, I think this works quite well considering the design of the dial. You’ll see in a picture further below that the watch uses a popular butterfly style clasp with a double locking push button release. I actually prefer these over a standard fold over clasp as I think they’re much nicer. The strap is 18mm which is in balance with the rest of the case sizing. The water resistance rating is a sensible 50m also known as 5ATM. 50m water resistance makes it suitable for swimming, white water rafting, non-snorkeling water related work, and fishing. Whilst this isn’t the highest rating I think it’s plenty for this style of watch. 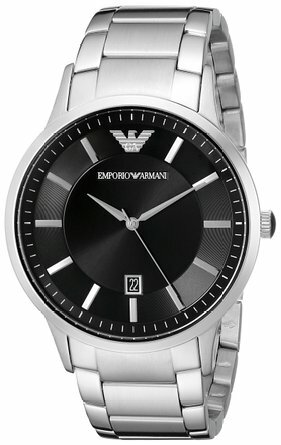 So there we have it, one of the most popular Emporio Armani watches currently available on the market. The feedback on this model has been pretty outstanding, to be honest, a huge amount of positive reviews and I have to agree with them, it’s a stunning stylish watch that’s in that perfect gift giving range. I Hope you found this Armani AR2457 review useful and enjoyable, comment below and let me know what you think of it.